Well, yeah, I thought, maybe Sherlock Holmes’s library–a fireplace, a lot of leatherbound books, and some comfortable armchairs–but the modern library? No way. If pressed to describe the decor of my office deep in the bowels of the University of Arnor library, I would use words like “Early Budget Cut” or maybe “Seriously Institutional”. But the more I think about it, the more I realize that Sara is right. After all, what is steampunk really but the fusion of two disparate things–the organic and the industrial, the ancient and the modern? Most libraries can be described using those four terms to some degree. Our work as librarians, after all, has remained largely the same since the 19th century, it’s only the tools we use (and the kinds of information we now manage) that have changed. Looking around my office, I realize that it could be described as “steampunky”–provided you interpreted that term rather broadly. In the back workroom, for example, salvaged wooden card catalogs (scrounged and transported by me and a rag-tag ensemble of put-upon students) hold row upon row of oral history interviews on audiocassette. The reclaimed card catalogs sit beside a table with a 21st century digitization station (our audio transfer/preservation station) which in turn shares tabletop space with a reel to reel tape player (certainly retro). Industrial shelving (another salvaged item) holds dark grey archival boxes made from acid-free paper (for audio storage) while the off-white walls show off an assortment of framed posters. (Historical Arnorian subjects, of course. My contribution to the office after the library’s renovation several years back). So we’re not a cluttered, boring office, we’re a nascent Steampunk workshop. Yeah! Feel that steamy goodness! Now if I can only find my raygun, maybe I can eliminate some of these paperwork piles …. Two years ago, everyone knew how the election of 2008 was going to turn out. Senators John McCain and Hilary Clinton would readily crush their hopeful, but unelectable opponents in their respective primaries. Crowned with inevitable laurels, these two would go on to face each other in the general election and the populace would yawn their way through another presidential race between two largely identical candidates. As for the rookie Senator from Illinois who had obviously been reading too many of his own press releases? Well, he would wage a promising, but doomed primary campaign which would then explode in his face due to his own inexperience. He would limp back to the U.S. Senate to lick his wounds, sadder but wiser, and with more respect for his elders and betters. I didn’t get myself worked up about the primaries. Frankly, when I surveyed the prospects both the Republicans and Democrats were putting forward, my first thought was that we needed to wipe the slate clean and start over from scratch. But the junior senator from Illinois surprised me. He managed his campaign well. He out-organized his more experienced rivals. He said things, thoughtful things, that made sense. Most of all, he was Change with a capital “C” and he made me believe that real change, change for the better, could actually happen. After 9/11, I lost my faith. Not my faith in God, but my faith in our system of government, the faith that we all grow up with, the faith that says that while our government might not be perfect, if we work hard and educate ourselves about the issues and vote our consciences and every other platitude about civic engagement, we can change policies and politics for the better. That our voice counts. That we, the Lower Downs, the non-Ruling Classes, that we matter. The fall of the Twin Towers took the scales from my eyes. I realized then that all of those hackneyed sayings about democracy I grew up with were only empty words. That it was the Higher Ups, the rich, upper class white guys who really ran things and rest of us just thought we did. That the Higher Ups did what they liked and the rest of us had to pay the price for their ineptitude and corruption. That it had always been this way and would always be this way and nothing we Lower Downs could do would ever change the course of the Ship of State, even if was taking on water and heading for the rocks. And I was angry. Deeply, quietly angry at everything. The System was rotten to the core, I was furious about it, and I didn’t know how to channel that anger constructively. Suddenly, the survivalists and anarchists and every other fringe group that I had ever laughed at seemed to have a point. If the Gubmint is really out to get you, then it make sense to have ready access to semi-automatic weapons. If the laws of the land don’t apply to the Higher Ups, then why should they apply to us Lower Downs? If courts can be sidestepped and justice subverted, then why not take the law into our own hands? On the surface, I was calm. But beneath that surface, dark thoughts swirled. I wasn’t about to jump into the abyss–at least not yet–but I was looking into it, as Nietsche says, and it was looking back. What specifically did I want to change? Everything. But peaceful change seemed out of reach and getting more so every day. Then Barack Obama came along and change, a sea change, suddenly seemed possible again. In his acceptance speech at the Democratic national convention, Sen. Obama said the smartest thing I have ever heard a presidential candidate say. This presidential race “isn’t about me,” he said. “It’s about you.” About how we wanted to live. About what we wanted our country to be like, not just for the next four years, but for decades to come. And it was within our grasp. We weren’t sharing his dream; he was sharing ours. The cynical angels of our nature tell us that no presidency can possibly live up to the great expectations, articulated or not, that the Obama-Biden adminstration has had heaped upon it. And it’s true that no one man can possibly juggle all those competing demands without disappointing someone. But this presidency isn’t about what Barack Obama can do as much as it is about what we can do together. And I believe–yes, I believe again–that we can do anything we put our minds to. Democracy is a fragile thing. It’s not based on laws or tradition, but on the faith and trust by and of the citizens in their republic and those they choose to represent them. Thank you, President Obama, for giving me back my faith. Would you rather stick your hand in the maw of a man-eating pumpkin than hear/see one more political ad? This guy knows exactly how you feel. Be brave, my peeps. It will all be over soon. Here, have some nice earwax on swabs–undoubtably, one of the most unappetizing appetizers I have ever seen. These folks had a nice spread at their Halloween party/housewarming. 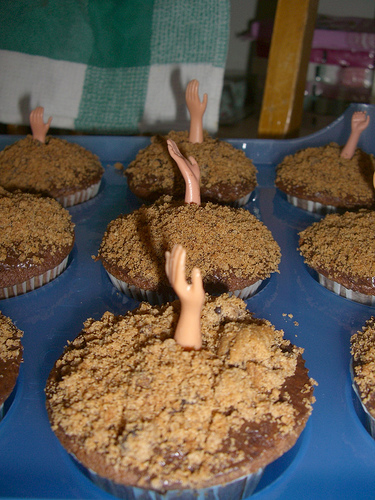 But you just can’t beat these “Buried Alive” cupcakes by oh_annalouise (Flickr). For something less sweet, try Gourmet Mom on the Go’s “Spooky Snake Pizza”. Check out her short video tutorial on how to make it (very easy). 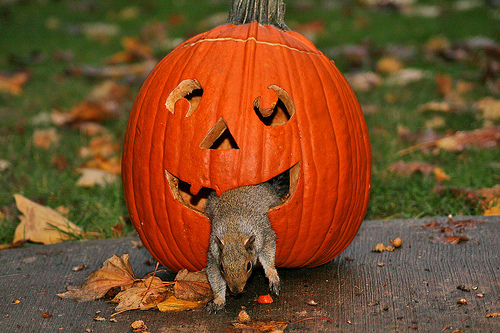 Then you should probably avoid looking at shesnuckinfuts’s “Projectile Varmiting Pumpkin” (Flickr). Whoops! Too late. Want to see something really scary? Check out the Dow Jones pumpkin shown here. Of course, you should also beware of the dreaded puppy-eating pumpkin.